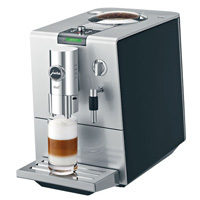 Jura produced another high-quality, compact super automatic espresso machine with this $1,496 Ena 9 model. The clean, elegant front panel will spruce up any kitchen counter, and the coffee this machine produces is fresh and flavorful. We especially appreciated the one-touch aroma boost, which makes the most of the coffee extraction process to deliver extra-strong espressos. Keeping up with and performing the maintenance duties is easy with the machine’s helpful reminders. While the compact design means you’ll have to refill the hopper and water tank frequently, it guarantees that your beans and water will always be fresh.